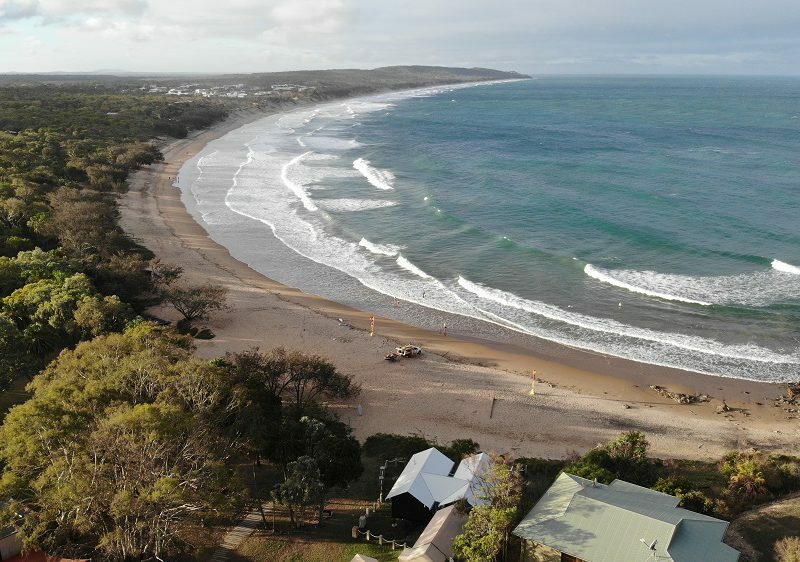 Have you ever heard of Agnes Water? It’s one of those almost secret spots, a small town of only 2000 people that lies safely on the coast somewhere between Mackay and Brisbane. Maybe you have driven past the turn off on the Bruce Highway halfway to your destination and thought ahh, if only we had the time to check that place out. Maybe next time. That’s exactly what we thought as we drove between our parents and in-laws for over 10 years before we finally made Agnes Water our primary destination, and then it became our favourite place to visit! The turn off at Miriam Vale winds you through verdant green pasture land and past national parks of open forest almost all the way to 1770. The 55kms gets eaten away by the feeling that you may just be onto something special here. You feel like you are leaving the rat race far behind and you glide past cute Airbnb cottages and permaculture farms. Over the next rise and there it is, Agnes Water framed by the sparkling blue waters of the Pacific. Nothing is difficult to find here and the road into town already takes you past the most important sites to locate later – the Foodworks with its amazing deli, the fantastic Agnes Water Tavern and drive-thru bottle shop, the holiday style resort shops cafes and takeaway places are located further down the hill next to another bottle shop and IGA. 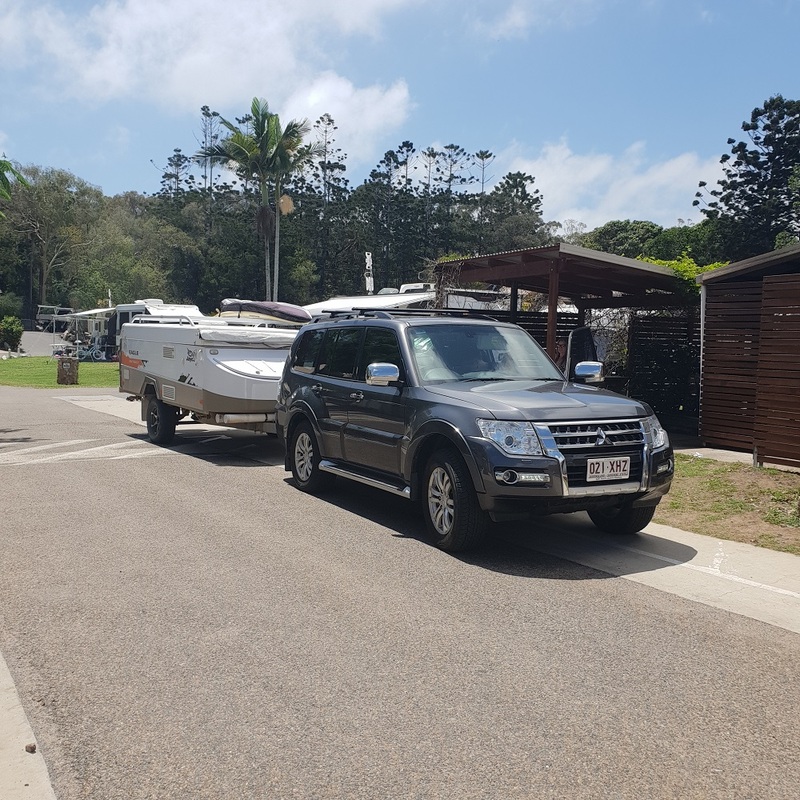 On arrival, we headed straight to our destination which was the Agnes Water Beach Holidays Caravan Park. Now this place is all about location location location! 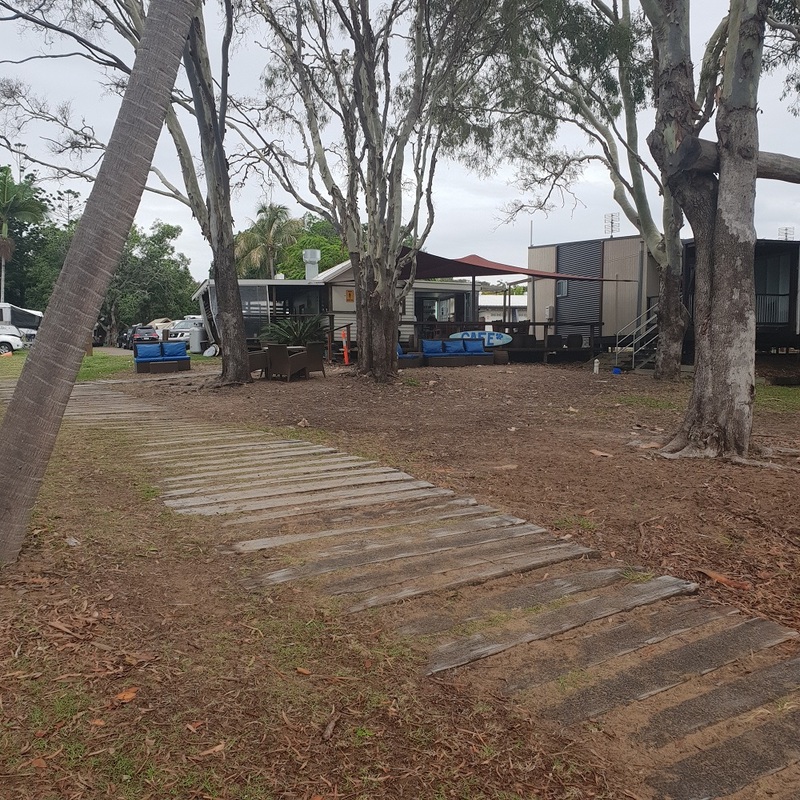 Nowhere else can you stay closer to the surf spot in the cove than the caravan park which occupies the prime position at the top of the beach. This is the only caravan park in Agnes, but there is another one down the road at 1770 which is also on the waterfront but more flat riverside. The other places to camp are some nearby National Parks including Deep Creek and Eurimbula which also have water access. For a small town, this place has a lot of accommodation options with prices to suit all budgets. 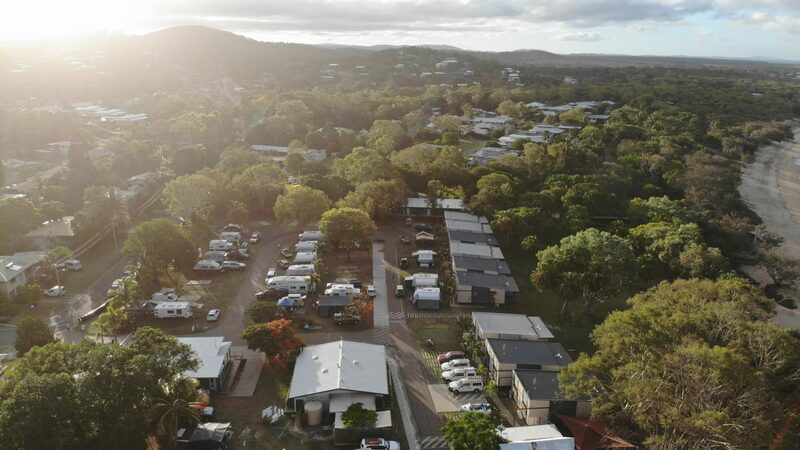 At the caravan park, you have a range of grass unpowered sites, powered slab sites, glamping tents and cabins scattered about the how many acre site. There is even an on-site cafe which is open every day and is the perfect spot for breakfast or brunch overlooking the gorgeous surf beach. They also have a 12 bed beach house called Jeffrey’s House on site but they don’t advertise rates or availability for this. You need to contact the park directly. The amenities here are incredible, but they could do with an extra toilet over the other side of the park I think. Walking to the toilet in the middle of the night was not really a long distance, but it was very dark. You would only do it if you absolutely had to. The main (only) amenities block is absolutely spotless and there are heaps of toilets and showers, so you never need to wait. There are cold water showers scattered throughout the park for your post ocean rinse, but they have removed the showers at the top of the beach since our last visit and it was a little inconvenient not having these there anymore. 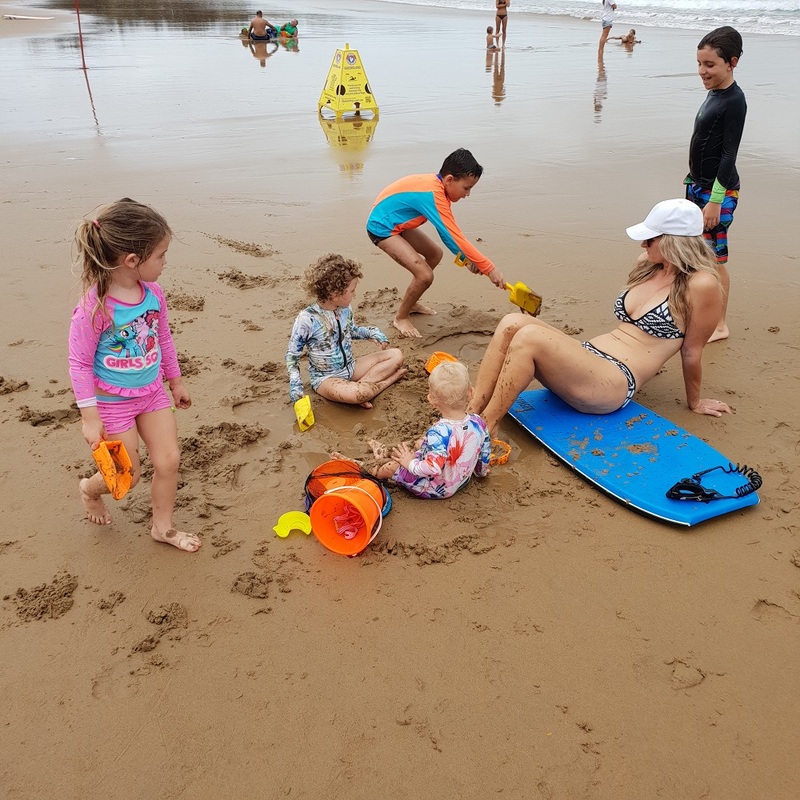 Not sure what prompted their removal as rinsing off straight from the beach is the best thing, especially with the kids who are usually whining about sand between their toes, or salt in their eyes. 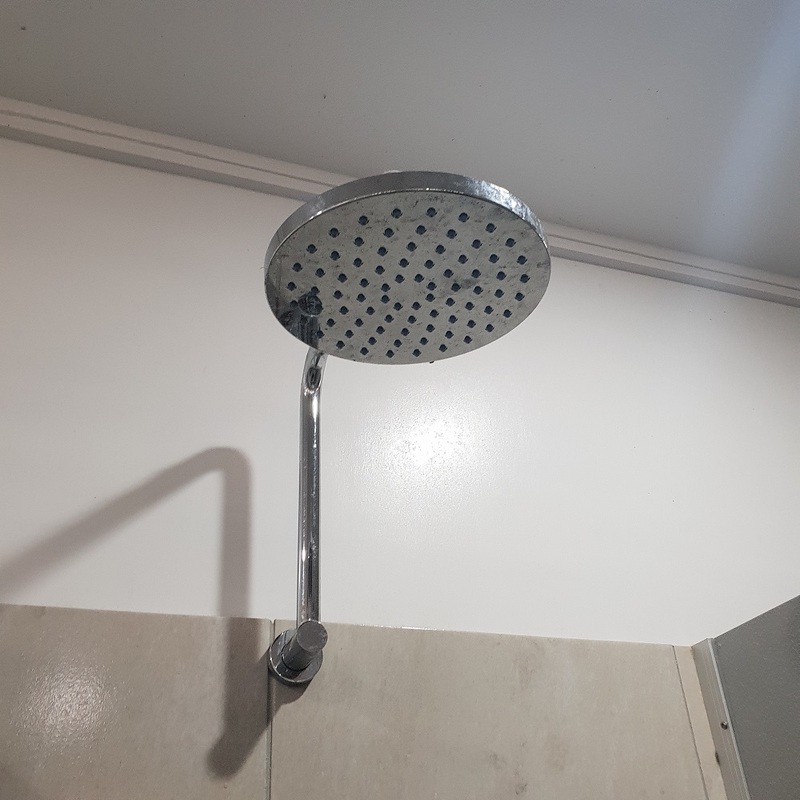 The waterfall shower heads inside the toilet block and the over the top hanging rack with hooks and shelves for everything made a hot shower a pleasure to partake in. It is so nice having a shelf for everything, and too many hooks for all your bits and pieces. Dropping things on the wet caravan park shower is the worst thing ever! Oh and there is also old time easy listening radio music wafting gently into the toilet room. This is such a nice touch. The only deterrent was the key system. With a $20 cash deposit (each key! ), it was always a little extra work to go to the toilet, and I misplaced my toilet key several times. They have to lock the toilet to prevent backpackers from using the showers for free and then camping out on the street but I think in this case a code system would be a lot easier and more cost effective. In our almost cash free society, it is difficult to provide $40 up front for a surprise key deposit. You can’t lose a code. Unless you are very forgetful. 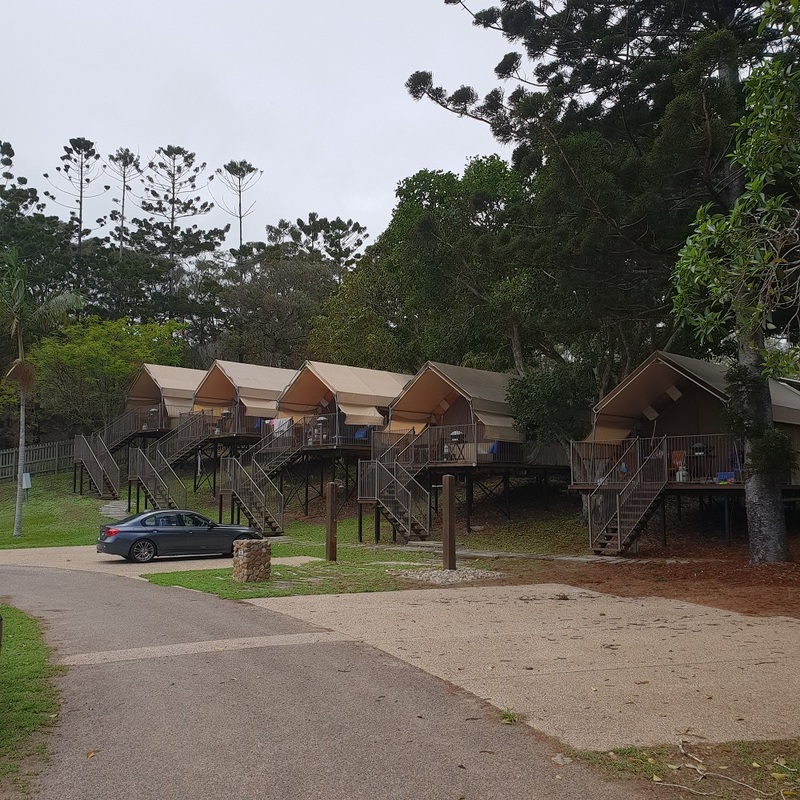 The cabins are gorgeous and have pride of place perched over the front beach. Even the elevated safari tents at the back of the park have views to die for. The sites are spacious with good water pressure but no trees in the middle sections which can mean it gets fairly warm in summer. In front of the cafe at the top of the beach is a stunning shady relaxing area which is perfect for mid afternoon drinks and lawn games with friends. The cafe serves a mixture of big breakfasts, cakes, ice-blocks, decent coffee and salads and light lunches. They are even well-priced and the relaxing atmosphere overlooking the surfers means you can dine with bare feet. Welcome to Queensland! Reception staff are friendly and lovely and obviously have great attention to detail, caring greatly about the park and the people staying within. They sell ice on the premises and can book tours also, ask them anything! 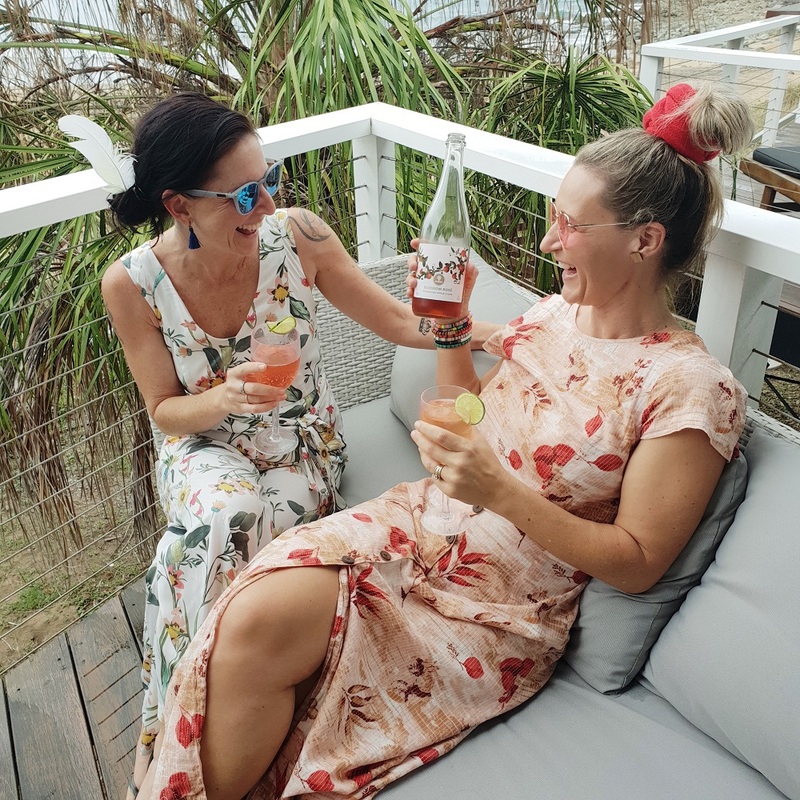 If caravan parks are not your thing, Airbnb has a range of awesome beachside villas for rent and these are perfect for sharing a holiday with friends and family. 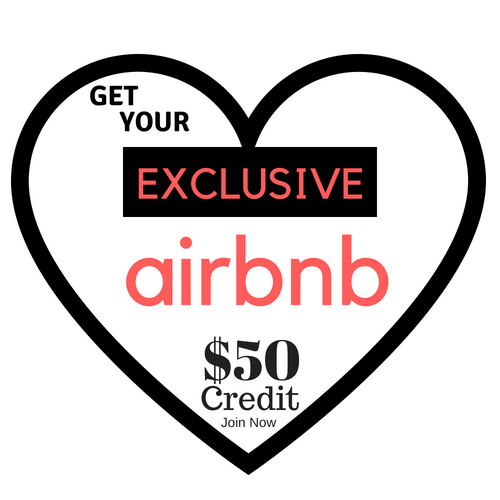 You can get a bonus $55 off your first stay if you join for free here. We love staying at Airbnb Villas, especially as a family with young kids. The convenience and value for money you get with a villa are second to none. Read our guide about booking a villa in Bali. 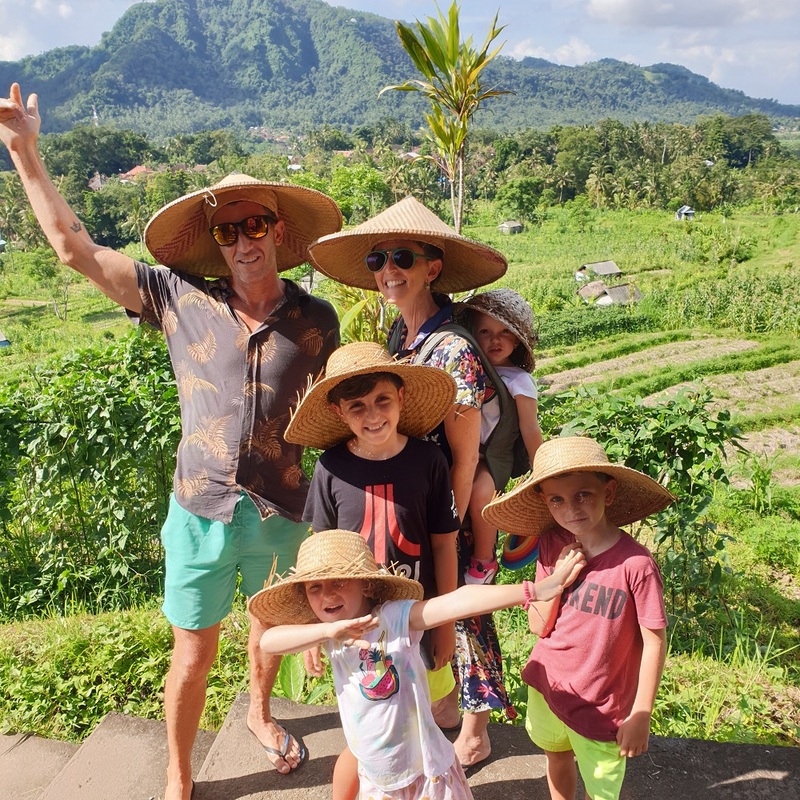 We are about to travel around the world with our family using only Airbnb and Skyscanner so make sure you subscribe to our blog and never miss an update! 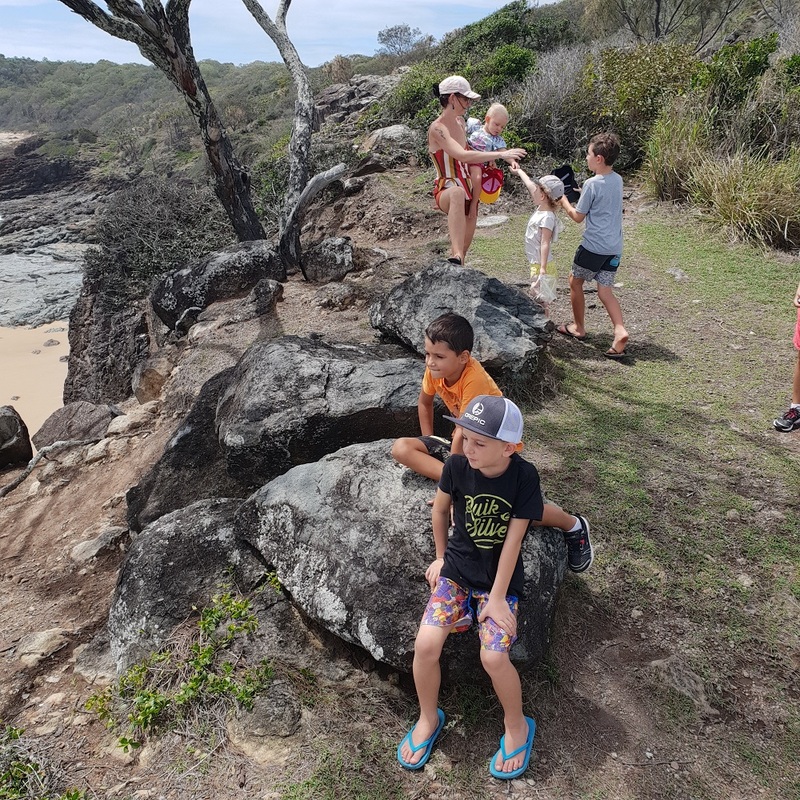 In Agnes Water there are so many things to do. Take a trip to 1770 and ride on the famous LARC (which is an amphibious vehicle); fishing, snorkelling and diving trips out to the incomparable Lady Musgrave island are popular; browse the shops for a tie-dyed sarong and a few crystals, or take a Fish and Chip takeaway dinner down to the beachfront park while the children play on the adventure playground. The Agnes Water Tavern has live music on a Saturday evening and they also have a courtesy bus from 5pm. There are surf lessons available from as little as $17 and the surf itself is perfect for beginners to intermediates thanks to its long slow waves. Great especially for experienced paddleboarders further out on the right hand point break or for longboarders in closer. There are some other secret surf spots around nearby if you get talking to a local, they may be inclined to share their location with you. We stayed for 4 nights here and we loved the relaxed atmosphere so much. It’s one of those special towns that makes you research property prices and check on Seek in case there is an opportunity to move there, you never want to leave. 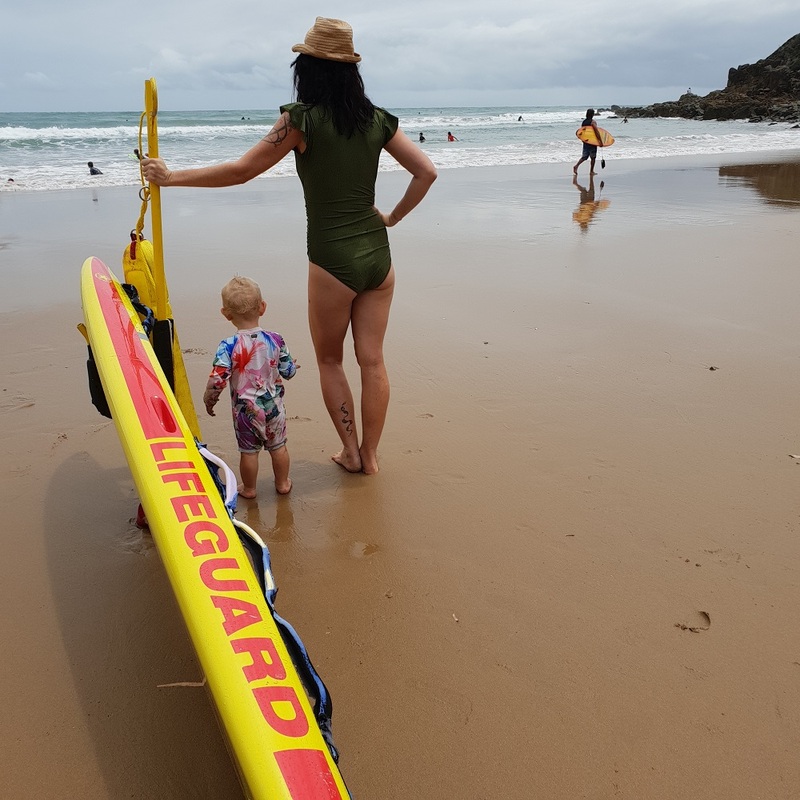 If you haven’t visited Agnes Water yet, get yourself there now. 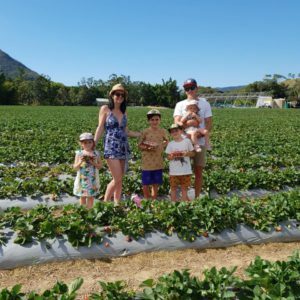 From Mackay we love to get our Brisbane friends to drive up and meet us there for a group holiday, it’s so easy! Since our first visit 6 years ago, Agnes has easily become one of our favourite places in QLD. What is your favourite place to camp in QLD? Comment below! Previous Post: « Tesalate Towels – Worth it or Not? Thank you for posting such an enjoyable and informative post! I hate that you all passed this place by for 10 years, but at least now, you are letting the rest of us know so that we don’t miss it, thank you! The safari tents sound like an interesting way to stay, I will have to do some research on that. I’m planning on saving your article for when we get the chance to go away again. Thanks again for posting all this info about Agnes! Awesome Kim, yeah it is a top spot, I can’t believe we didn’t get there sooner! Oh well we will have heaps of opportunity for awesome family memories at Agnes for years to come I am sure. I really hope you get to visit there someday soon! That looks like a nice place to visit, the water is breathtaking. I live in the States and I have never visited Australia before. I am planning a trip for later this year around December. If I go there around December, will the weather be perfect to visit or it will be a little chilly? I really want to stay in the cabin, it looks really nice. Perfect for a low key vacation. Thank you in advance. In December the weather will be warm and absolutely perfect!